Ten years ago, gallerist John Berggruen encouraged me to take a look at a young artist he was representing, Isca Greenfield-Sanders. As Berggruen steered me to the upper level of his Grant Avenue gallery, I found myself engulfed in a sea of pastel paintings, pink oceans, periwinkle skies, vast horizons, and ocean bathers. Greenfield-Sanders’s compositions skillfully combined the happenstance perspective found in her source material—anonymous photographs—with a nuanced reference to Degas. The works ranged in size, some small, others majestic, evoking childhood memories of Cape Cod, warm skies, and the beach. I could almost smell salt spray and suntan lotion. Greenfield-Sanders operates with purpose in everything she does. She grew up in a family of artists. Her academic love was mathematics, but her heart was in painting. Her father is the renowned photographer Timothy Greenfield-Sanders, whose portraits are internationally Known. Her grandfather and uncle are artists as well. There was no doubt that growing up under the lens of her father’s camera influenced Isca’s work, both by imparting his artistic instincts to her and by providing a frame for rebellion and for the development of her own unique vision. The source material for Isca’s work is anonymous family photographs and slides purchased through eBay. The subjects and memories held in these photographs don’t come from the artist’s own history, but represent average American family vacations during the 1950s and 1960s. . The blurriness, the overexposures, and the fading pigments are immediately recognizable as the product of Kodak film and Instamatic cameras. When I first met her at her studio on New York’s Lower East Side, she was already a well-established painter, even though she was only 25 or 26. She has green eyes, dark hair, lucent skin, and an oval face. Her studio was organized and tidy. Isca uses a complex process to compose and create her paintings. She starts by digitally scanning the slides and printing them out in various sizes on paper. She hand-colors the printouts with colored pencil and watercolors, dissolving the water-soluble images in places and flattening out or concealing details in others. The loss of details further distances the viewer from the scene, so that the images evoke a sense of nostalgia and fading memories. Then she rescans each altered drawing to use it as the underlying image for a painting, transforming the images yet again into another medium and scale. Each time we worked together on projects at Paulson Bott Press, we found innovative ways to improve the method we used for making the etched photo-plate that served as the backbone for the work. For the first project, we used an old-fashioned dot matrix silkscreen, printing asphaltum onto a copper plate before etching. Later we evolved to using a commercial ink jet printer to print an acid-resistant image on the plate before etching it. Working with her, I was immediately struck by Isca’s confidence and curiosity. She is a problem solver who is literally ambidextrous, nimbly switching from right to left hand to write or draw as well as sketch out an idea. 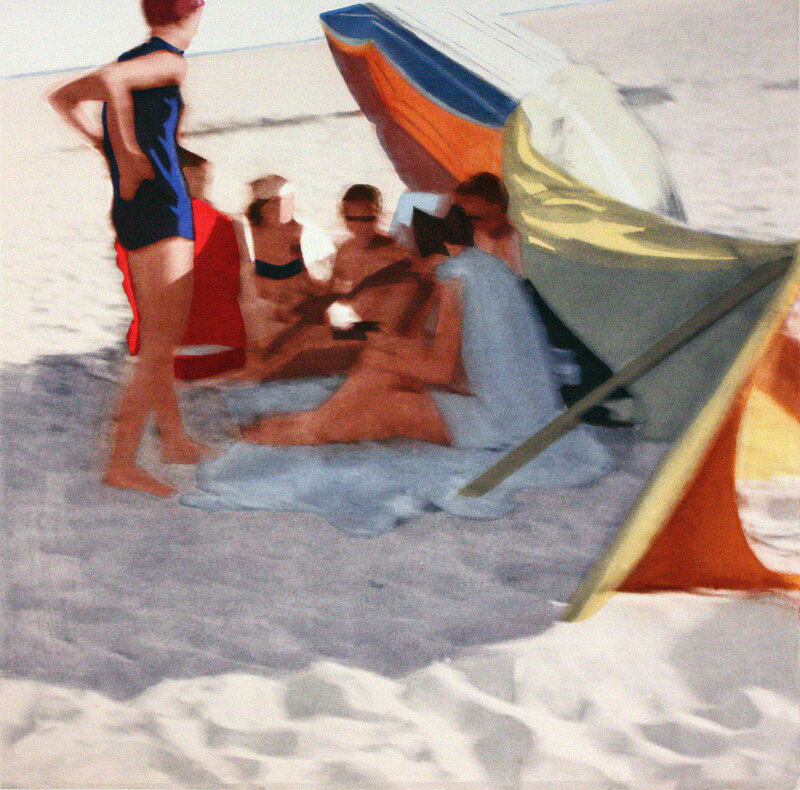 Her recent show at John Berggruen’s gallery, Inherited Landscape, continued her investigation of water and beach scenes, masterfully conjuring up the nostalgia of a time just out of reach. The power of Isca’s prints and paintings comes from her ability to pull the viewer in, gently reminding us that time is fleeting. She encourages us to treasure those precious moments we all know so well but forget to savor: time spent in nature with family and friends. Renee Bott: Tell me a little bit about your history. Sanaz Mazinani: I was born in Iran just before the 1979 revolution. Most of my childhood was framed by this incredible shift in a nation that lost its strength because of the revolution and then the Iran/Iraq War. Yet I had this amazing, wonderful childhood. We left when I was 11 to come to Windsor, Ontario. That was shocking, because I had lived in this big metropolitan city of 8 million and then moved to this town of 200,000. I thought I was going to the New World, but instead I was asking, "What is this village? What's happening?" Eventually we moved to Toronto. RB: Why did you come to California? SM: I came out here to do my MFA at Stanford. RB: When did you decide that you were definitively an artist? SM: First I went to the University of Toronto for genetics and molecular biology. That's when I decided that I could not be in the science realm, I needed to be in the arts realm. For a long time, I thought I would be a curator or an activator behind artists, helping artists be who they need to be. Then I realized, while I was working at a gallery, that I had a lot of my own things to express, my own ideas to say. RB: Do you consider yourself a photographer, or something other than that? SM: Photography is my first love. It's what revealed art to me. I remember being in high school and coming across Annie Leibovitz and thinking, "Look at the creativity in this single photograph." Then I was also intrigued by the way that different groups of people were portrayed through images. Being born in Iran and having a certain image of the country proliferate in Western media made me clue in to the power of photography and how it could influence thoughts and even social understanding. In order to best describe photography in this language of perception, now I often use video and sculpture and installation. RB: How did you move from being a photographer to breaking the photographs apart and turning them into patterns? SM: I was thinking a lot about living in the Bay Area and facing all the shifts in technology. No matter where we live, we are part of a digital network of information. From our Facebook feeds to the way that we get our news, it's all in this webbed network. I have been thinking about how an image circulates through that network. The first time you see a picture of an event, how that forms in your mind, and what happens if you see it again and again and again, over and over in a short period of time in different places. I wanted to make work that visualized this pattern of image distribution and how it influences us.What's amazing about the printed image, the multiple, is its duplicity and its ability to be in multiple places at once. So it becomes much more accessible. But also the repeatability, the over—over and over—exposure can also lead to a certain limitation, because that particular image is taking up the space of many alternative images, or points of view. I think a lot about the power of the photograph as well as its limitations. MISSION, 2015, & RICHMOND, 2015, 20” x 20” Pigment print on archival paper. RB: You are breaking the images into motifs that reference Islamic patterns. SM: I call them Islamic ornamentation. That's what they look like to me. Often my subjects deal with issues around conflict and representation war in the West. I thought, "What would happen if I brought some of that Eastern visual language into the conversation—almost like this Eastern art language is infiltrating the Western art world—to create a juxtaposition that will then become a point of conversation?" RB: When did this idea come to you, of taking everyday life and turning it into this pattern that references your heritage? SM: My husband is French-Canadian-American. In 2010, I went with him on his very first trip to Iran. We went to different architectural sites such as mosques and palaces and looked at amazing mosaics and Islamic ornamentation patterns. When I came back, I was struggling with how to discuss the representation of a specific journalistic photograph that changed depending on the caption or the context. 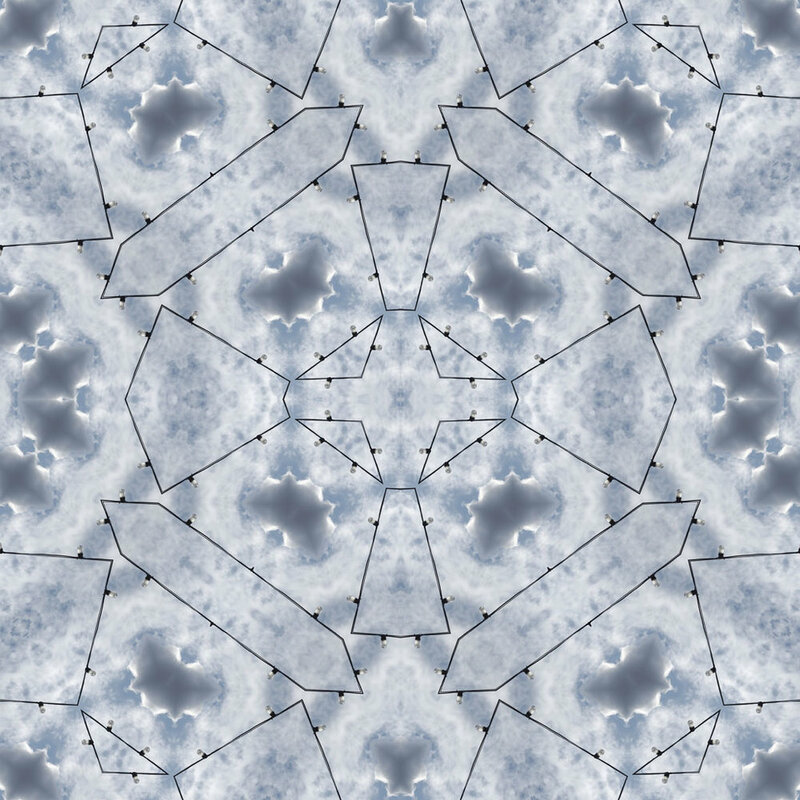 I started making these patterns. From this overwhelming exposure, it needed to come out. In this Forever in the Sky series, I am using images of San Francisco skies. It’s very much about the coming together or celebration of two worlds at the same time. I imagine that the clouds that visited the skies of San Francisco would cross over so many borders without having to go through any checkpoints or customs. I imagined the beauty of this kind of freedom. I wanted to bridge the gap between the cultures by bringing together two languages, the photographic image of here and the patterns of the East. RB: Do you consider some of your work as political? SM: I think everything I've touched ends up being political. Making art is a political act. It's contributing to the world. It's giving something of yourself. It’s best for my practice to share what I know through the artistic language. I'm from Iran and I live here. There's racism and there's war and there's injustice. My experiences are going to hold some of that in the work. RB: Can you talk about mirrors in your work? SM: I use mirrors often in my work because for me they stand in for the photograph. You see yourself reflected in the work. The historical time frame of when full-length mirrors became a popular household object is very close to the beginnings of photography. Since then, our physical bodies have been imaged so much. I'm interested in that experience of being aware of this and in how one perceives oneself. RB: Are mirrored mosaics used a lot in Turkish or Iranian design? SM: Yes, and the history of its use in the Persian Empire is rather fascinating. The process of assembling intricate geometries in mirror is called Aineh-Kari and originated in the 16th century of the Safavid Era. 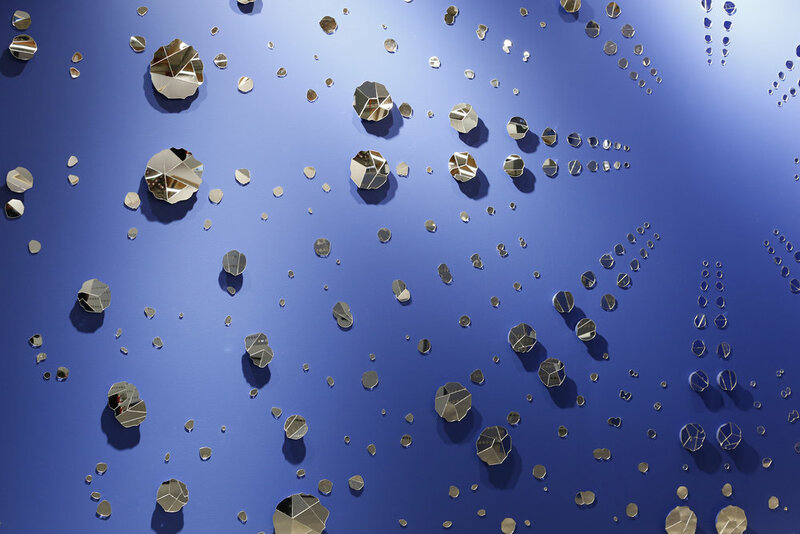 Mirrors were some of the most expensive and rare objects of that time, as they were backed with silver, and furthermore were only fabricated in two factories, one in Venice and the other in Paris. Since they were imported from Europe these objects would often break in transit, but the architects and craftsmen decided that they could still use this precious material by applying the traditional style of mosaics making to them. Hence they further cut up all the broken pieces to make elaborate mosaics. RB: Where do you see them? SM: You see them a lot today in some of the palaces and mosques. There is a particular mosque in Shiraz, the King of Lights, where all the walls are covered with mirror mosaic. When you walk through it, you see your body moving, but you never see your features. It is a truly spiritual experience, a unique relationship to architecture that I have wanted to bring to the West through my recent practice.